Rationed rice was said to be worse than black market rice. Housewives in a “Cheap & Delicious Rationed Rice” movement are sampling black market rice. The Japanese government uses a special payment system to support farmers who grow rice. 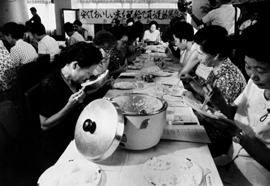 During the war under the Staple Food Control Act (1942), rice was rationed to make sure city people would have enough to eat. Farmers had to sell all their rice to the government at a set price, and the government then sold the rice through special rice dealers. People were only allowed to buy a certain amount of rice each month. This system of rationing was retained the first years after the war, when food was still in short supply. After 1955 farmers could sell as much or as little rice as they wanted to the government. The government bought the rice at a high price to encourage the farmers to sell it to them. It then sold the rice at a somewhat lower price through the official rice dealers. Over time, what began as a system of rationing a scarce but essential crop has become a subsidy or price support to farmers. Click on CHARTS, below, to see how much rice the average Japanese eats each year.